Are you prepared for Engineering 4.0? What is the next wave of best practices in engineering? How will best-in-class companies continue to differentiate themselves from their competition? To understand where the future trends in Engineering are leading us, we should step back and review how we got to our current point in history. Engineering and manufacturing have been around as long as the earliest inventions including the wheel. While papyrus (thin paper) was manufactured as early as 2550 BC, today’s modern design and engineering can be traced back to the start of the industrial revolution in the 1760’s. 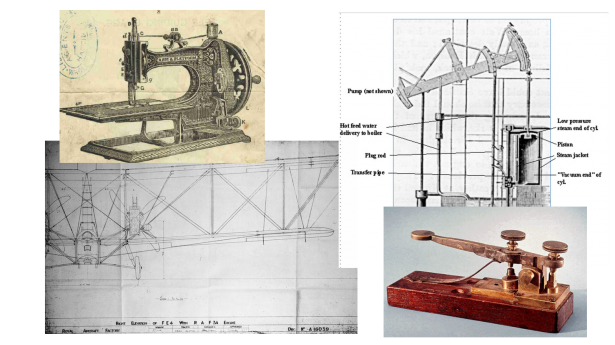 Incredible inventions were designed and manufactured through the early 1900’s using pencil and paper, vellum or mylar (and trial and error) such as the steam engine, cotton gin, telegraph, sewing machine the Model T Ford automobile and flying machines. While materials and manufacturing methods became more sophisticated, the methodology of creating technical drawings did not change substantially until the computer age. With the advent of computers, first expensive mainframes, then mini-computers and finally personal computers, engineers, designers and inventors were able to place circles, lines and arcs virtually on a computer screen. This revolution improved over 20-30 years and is still available and in use today by many individuals and organizations. Significant increases in speed could be realized, especially when making any changes as the need to erase pencil or ink was replaced by a simple electronic eraser. Computerized drafting tools advanced negating the need for performing mathematical calculations to find midpoints, areas, centers of gravity. In addition, problems that could only be solved using complex true projection calculations (such as in calculating true lengths of non-prismatic shapes) could now be solved using correctly drawn geometry with basic r drawing techniques. While some 3D capabilities existed for very well-funded companies in the aerospace and automotive industries, the mass market was not exposed to 3D CAD until the early 90’s. SOLIDWORKS mission to enable 3D on every Engineer’s desktop was started in 1995 and has since reached out to include over 2 million users in education and commercial endeavors. 3D CAD has evolved each year to add more power, speed, realism and efficiency to creating and inventing anything. In addition to creating fantastic designs and bringing ideas to life, engineers can now simulate, test or validate their designs before any manufacturing takes place. Parts can be tested for strength under different loading conditions, analyzed for failure due to thermal, vibration, buckling or fatigue. Electrical circuits can be tested, fluid flow can be analyzed and plastic injection molding processes can be designed and tested before melting any pellets. All this CAD and Simulation data can now be organized in a secure vault, known as a Product Data Management (PDM) system, which can not only manage revisions and prevent data overwrite, but can keep track of the complex relationships between parts, sub-assemblies, assemblies and related engineering information such as simulation results, specifications, shop floor instructions, quality assurance inspection reports and renderings, animations and technical illustrations. 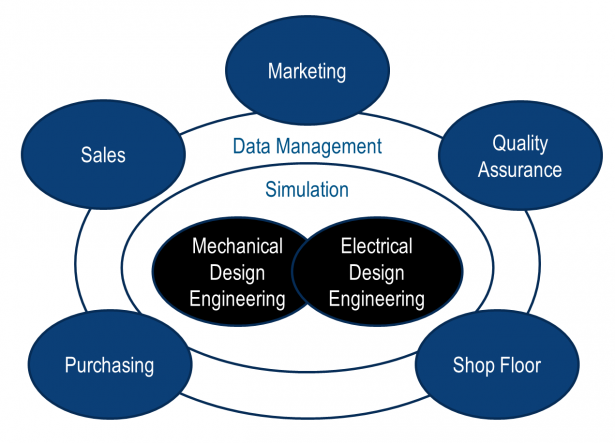 Engineering 4.0 – 2015 – ? So, what is the next revolution in Engineering? It is no longer acceptable to expect each department or employee to search for engineering data and recreate designs in order to accomplish their job when this can be automated in the early stages of design. Sharing data with everyone that needs access, but in the right format and is distributed using an automated delivery and update mechanism is the key to enabling Engineering 4.0. Each stakeholder within the company and the supply chain should be able have access to the information they need in the specific format they need it 24/7 using a secure centralized vaulting system. By providing the right format info such as price quotes for sales, bill of materials for purchasing, renderings for marketing, animations and exploded views for documentation, inspection drawings for inspection, model based definition eDrawings, 3DPDF, STEP, IGES files, every department will have more time to do their essential jobs and spend less time recreating and re-interpreting data. Engineers can leverage theirdesigns to provide renderings and animations (.jpg, mp4) to Marketing for web sites as well as exploded views and bill of materials (xlsx) to Technical Documentation. Quality assurance ballooned drawings and inspection reports can be created automatically from PDF and CAD (.slddrw) drawing files eliminating hours of manual labor. Complete electromechanical Bill of Materials can be shared with Purchasing to enable early visibility into inventory and external manufacturing requirements so projects are not delayed due to lack of materials or parts. Fully dimensioned 3D drawings (.edrw, .eprt, .easm, .edrwx, .eprtx, .easmx or .pdf) can replace the older 2D drawings prevalent for hundreds of years utilizing model based definition (MBD) concepts that enable large screen monitor or tablet viewing of engineering information, on the shop floor with an interactive capability that reduces manufacturing confusion and errors. The key is to review the needs of every department with respect to engineering information and to provide a delivery mechanism for them to get the up-to-date information they need in the format most conducive to their task. Using automated tasks, integrated CAD, Simulation and Technical Communication tools, the right data can be created automatically. Using a product data management (PDM) system as a delivery mechanism can ensure that every user in every department gets the information they need in a usable format saving them multiple hours by eliminating duplicate work. The shop floor may need STEP, IGES, DXF, SMG, eDrawing or 3DPDF files to view shop floor instructions, feed CAM programs or setup tooling. The marketing team may prefer JPG and MP4 files where purchasing may need Excel XLS BOM files and Sales may want quotes in Word DOC format. In each case where downstream information is shared correctly (format and delivery mechanism), the potential for savings is tremendous. Duplicate work eliminated by each department can create time and cost savings of at least 20% and in some cases 80%. Getting each department the up-to-date information they need in the format they can most easily use is the key to the Engineering 4.0. This can be accomplished with an integrated product portfolio of Engineering Tools such as the SOLIDWORKS 2015 Product Portfolio in conjunction with our hundreds of Partner products to create the system that is most effective for your company. Looking for more information on Engineering 4.0? Read our article and infographic to learn how your company can leverage these best practices with Engineering 4.0.